General orthopaedics including fractures. All aspects of hip and knee surgery, including: primary, complex & revision joint replacement. Mr Whittingham-Jones also performs hip arthroscopy and knee ligament reconstruction. Mr Whittingham-Jones provides a specialist trauma & orthopaedic service at West Herts Hospitals NHS Trust. Clinics are held at Watford General and St Albans City Hospital and operations at Watford and St Albans City Hospitals. You can be referred to Mr Waters by your GP under the 'Choose & Book' system. 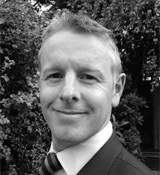 Mr Whittingham-Jones qualified from The Royal Free and University College London Medical school in 2000. He underwent specialist training on the Royal National Orthopaedic Hospital, Stanmore, specialist training rotation. He developed an interest in surgery around the hip and knee and undertook higher level training at St George’s, Tooting in pelvic and acetabular surgery as well as reconstructive surgery of the hip and knee. Sub-specialist training in internationally reputed fellowships then followed. He developed skills in treating young adults with hip problems at the RNOH, Stanmore with Aresh Hashemi-Nejad. He spent a further year in Ottawa, Canada under Professor Paul Beaule. Mr Whittingham-Jones remains involved in research looking into various aspects of orthopaedic surgery of the hip and knee. He continues to publish work and present research at international meetings. Any free time is spent with his family, cycling and following football.